The 10th Security Forces Squadron at the Air Force Academy will gather today to say to say goodbye to one of their own – Aghbar, a German shepherd and the Air Force’s most decorated military working dog. Man’s best friend in many ways has become an airman’s best friend, with hundreds of dogs accompanying airmen, soldiers and marines on patrols in Iraq and Afghanistan, along with working base security and law enforcement back home. Experts estimate that one dog is responsible for saving the lives of 150 service members, according to a call for legislation to improve the adoption process for retired war dogs. The 10th Security Forces Squadron has seven of these pups currently working with them, but is planning a service for today to honor two they lost, Aghbar and Odys, a recently retired Belgian malinois. Aghbar, who joined the Squadron in 2002 at two years old after training at Lackland Air Force Base, Texas, served thousands of hours on walking patrols, deployed to Afghanistan, worked with Secret Service dignitary missions and won several awards at police dog competitions across the country. Aghbar retired in March but had to be put down in May for health reasons. 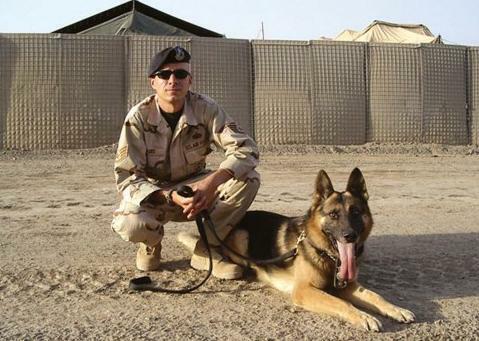 In 2007, Police K-9 Magazine profiled Aghbar and his handler, Staff Sgt. Kristopher Evers on their first mission outside the wire, on a patrol tracking down IED makers in the area. The two worked together, searching a suspected Taliban compound. They ate and slept together during their deployment. War dogs have gotten more attention as the wars in Iraq and Afghanistan progressed, with about 600 dogs serving according to The New York Times. One dog in particular, a Belgian malinois named Cairo, captured the public’s interest after it took part in the Navy SEAL raid that killed Osama bin Laden last month. Lackland is the hub of military dog training, with the 341st Training Squadron holding an average population of 800 dogs working in 90 training areas in 400 acres. The dogs are trained for the Air Force, Army, Navy, Marine Corps and civilian agencies such as the Department of Transportation. Thanks for the article. I had Aghbar for 5 years and he was my first Military Working Dog, and the Air Force Academy’s first ever K-9. We had been through a ton of stuff together and I think that dog had seen more than most people. I know the Academy is sad to see him go, as am I.